AVLUX Hosting Review 2019: Is AVLUX Hosting a Good Hosting? US-based Avlux was founded by Andrew Vonderluft, a tech nerd with a background in programming and linguistics. His company offers a range of shared hosting, dedicated servers, CMS hosting, and programming-language specific hosting for Perl, Python, Ruby, Rails, and git among others. 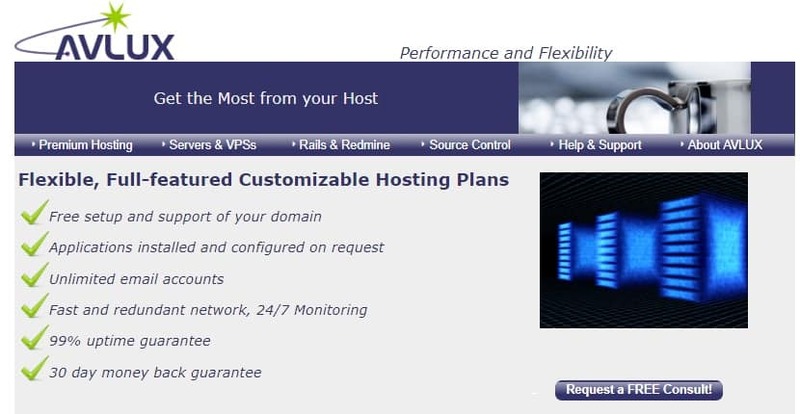 Avlux has a number of feature-rich and flexible hosting plans and services designed to meet the diverse needs of their customers. Aside from premium hosting, they also provide customer dedicated servers, VPS, and hosting for WordPress, Rails, Radiant CMS, Redmine amongst others. Their servers are located in the secure Softlayer data center with Tier 1 network in the US. Avlux operates robust and reliable servers which are housed in a secure data center with redundant infrastructure and network, something which contributes to their stability. With a 99% uptime guarantee, you can rest easy knowing your website will be accessible to customers any time. Network engineers are onsite to resolve hardware issues before they knock off your website or PHP apps. I haven’t heard any of their customers complain about server downtime or performance issues. That speaks volume about the quality of their hosting services. Losing business data is a nightmarish situation that most people don’t want to face. Lucky for you, Avlux provides daily hourly backups across all plans. You can choose local or remote backups for disaster recovery and data restoration purposes. Their backups overwrite any of their previous data, so I strongly recommend that you maintain backups of your own too. Avlux takes security seriously I guess that’s why they offer IPS, Network IDS and DDoS protection. Directories support password-protection while their servers are hardened and hack-protected. So you have nothing to worry about denial of service, or malicious traffic, or any other type of internet threat targeting your website or files. Even with their dedicated servers, you get the feeling Avlux is right on the money. Dedicated servers and other high-level plans are fairly priced, but when you come to the low-level or starter packages, you’ll find them slightly expensive. Feature-wise they’re good so I have no doubt you will love the customization options and their performance too. But if the price of shared hosting is an issue, I’d advise you to consider iPage or Hostinger. Once you place an order, you can pay conveniently via PayPal or any of the major credit cards. They don’t charge set up fee. Details will be sent to your email. My only concern is that server setup takes 48 hours. But once it’s up and running, they will assist you with OS and software installation at no extra cost. You have 30 days to test-drive their servers. If you’re not happy, you can cancel your plan and they’ll issue you with a refund. Support is great and expensive. Thanks to a true techie with hands-on experience, you have little to worry about server problems or any hosting-related issues. Call, shoot an email, or fill out the contact form; you will find help in reasonable time. Alternatively, you can open a ticket and raise your issue there. Network engineers also monitor the health, reliability, and performance of their network to ensure your website never goes offline. Aside from personal support, they have some documentation (not a knowledgebase) on general hosting issues and other technical topics. With some niche hosting options, Avlux is a great choice for techies or coders who want to tinker with various programming tools and frameworks. Wondering how AVLUX Hosting stacks up against other Web Hosting companies? Enter any other Web Hosting company and we will give you a side-by-side comparison.